Revlyn Demolition & Recycling has the manpower and machinery to handle the biggest industrial demolition jobs in and around Edmonton, plus we have the capability to travel throughout western Canada. 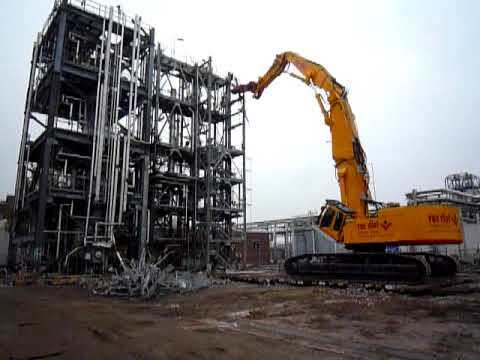 Our operators can bring down almost any existing industrial structure in a safe and efficient manner. We’re especially adept at tearing down only specified sections with no resulting physical impact on nearby buildings. From chemical plants to oil refineries, Revlyn Demolition & Recycling is experienced in handling any number of hazardous materials, and our work processes always support proper environmental remediation. Industrial hygiene is a primary concern for us on any job site. Our equipment and rigging expertise ensures that we always achieve the best results, not only for your business, but for our employees and the surrounding community as well. Whatever the industry, if you’re planning to decommission your location, we’re the team to call. You’re invited to get in touch with any questions you may have.